Grey. That was the day. Like most November days in Vernon, BC. Bundling against cold, I made my way from Sveva Caetani’s pleasantly haunted mansion across a downtown where I lived, worked, and grew up (somewhat) for the first twenty years of my life. I was going to meet Kerry Gilbert. As creative writing instructor at Okanagan College, Gilbert personifies all that’s good in contemporary literature. We were meeting for coffee at a place called Triumph. I admit I felt like a winner. Being early I settled in with a washbasin of latte. I felt the author’s energy before she walked in, ebullience radiating like rolling red carpet. I knew the smile from social media. In person, the poet’s energy supplanted my tub of caffeine. Sharing an alma mater and a hometown, we had plenty to talk about, visceral memories the common theme. Like the imagined carpet preceding her, I found crimson colouring an otherwise monochrome day, blush of autumn deciduous and the hooded cloak of a forest bound girl. Judiciously portioned into well-trimmed servings, Kerry’s interpretation pulls us along in tidy chapters, a riparian flow without traditional titles topping each poetic installment. In a suitable haze, lines blur between anticipatory warning and raw statement of fact. But with a lupine lunge we’re snatched, deep in the maw, the tale now grisly and all too real. Which conjures an unnerving memory, a Vernon night in forest hills as coyotes howled – wolf calls and cries of still fresh prey – along unforgiving highway that Gilbert drives most days, past homeless prophets and makeshift memorials. where do you stand with jesus christ? While predatory musk hangs heavy in each suite of verse, optimism remains, resilient. This is not poetry to simply be read. More than inky veins on paper, we feel the warning of elders, vulnerability of experience braided with a mother’s protection – fierce yet unfailingly compassionate. Once more I finish this book and am struck by Kerry’s gift, her skill – utterly unique verse – the result of effort and knowing one’s voice. 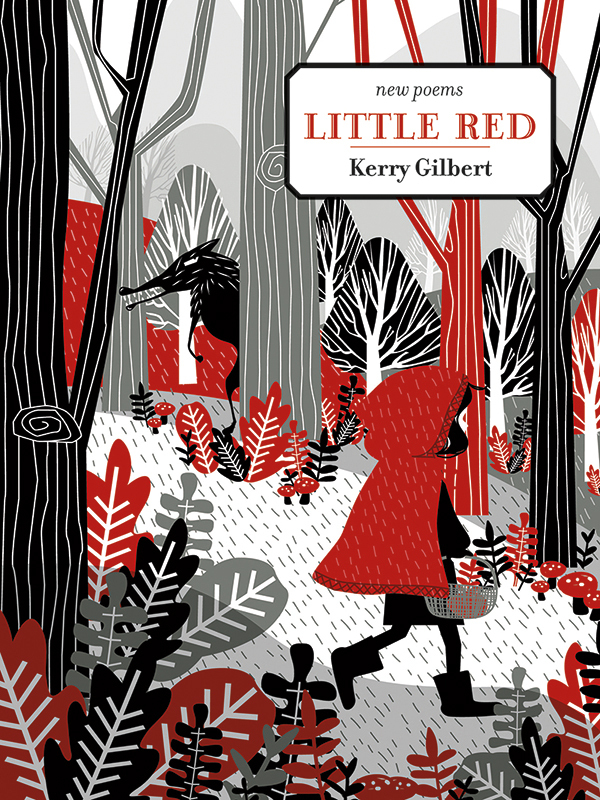 Little Red is indeed a seamless and uniform fable, at times uncomfortably real. I envision a poetry neophyte questioning this flight of compact pieces – a path of polished stepping stones. Are these poems? Is this a story? Are these headlines? The simple answer is yes. Little Red is all of these things, innovative and brave. It’s what I seek out in a book of poetry. That eureka moment when an Artist-and-Repertoire agent says “Yes!” This is new. This is special. The reinvention of an ancient, cautionary tale through contemporary characters, reality and firsthand knowledge. Well done Kerry Gilbert. Well done. Kerry Gilbert lives in Vernon, where she teaches Creative Writing at Okanagan College. Her first book of poetry, (kerplnk): a verse novel of development, was published in 2005 with Kalamalka Press. Her second book of poetry, Tight Wire, was published in 2016 with Mother Tongue Publishing. Gilbert has won the Gwendolyn MacEwan Poetry Award for Best Suite by an Emerging Writer and has been shortlisted for ReLit, for the Ralph Gustafson Prize for the Best Poem, for the Pacific Spirit Poetry Contest and for the Gwendolyn MacEwan Poetry for Best Suite by an Established Writer.